And it's cheaper than many other non-Sony Bluetooth headsets. Fallout 3 Special Amazon Edition includes life size Pipboy! 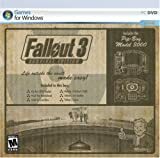 Fallout 3 has three editions to choose from: Standard, Collector's and the Amazon.com exclusive "Survival". The "Survival" edition including the bonus Pip-boy 3000 digital clock along with a host of other collector items including of course the Fallout Lunchbox, Art, Making of DVD, and Bobble Head. Super Smash Bros. Brawl for Wii $25.99 Shipped NEW! Amazon has this awesome deal. Usually goes for $49.99. Hurry, get it while supplies last! Rock out to Guitar Hero on the DS with the Guitar Hero Guitar Grip and local wireless multi-player modes. Use the stylus to strum the touch screen like a true rocker. Select from a variety of classic rock, pop and alternative rock favorites. Included is the 4-Button hardware peripheral which fits smoothly into the DS. You have to buy it but you know you still want it. If you don't then you will be missing out on, easily, one of GREATEST games of all time! God of War III allows players on the PlayStation 3 to take on the climatic role of the ex-Spartan warrior, Kratos, as he treads through the intimidating heights of Mt. Olympus and the dark depths of Hades once more to seek revenge on those who have betrayed. GoW 3 along with Killzone 2 are listed for pre-order at amazon.com along with their release dates.GoW3 : March 2, 2009.KZ2: February 28, 2009.
today only they are blowing out some DS games including Call of Duty 4. Click on the Gold Box or "Today's Deals" to see the others. ROCK BAND for the Wii!! !